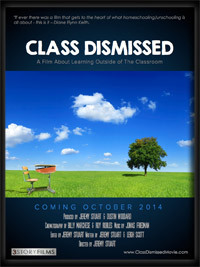 First make sure your city doesn't already have an upcoming screening: Class Dismissed Private Screenings. 1)	Research theaters in your area to find out what it costs to rent the theater & how many seats are available at that price. It doesn’t have to be a small independent theater. Sometimes large theater chains rent out their screens. 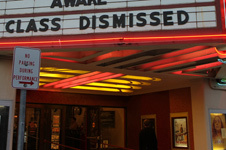 Examples include AMC, Regal, and Landmark. If you live in a large city, we hope you can find a theater for around $800 or less for 2-hour rental on a weeknight. Smaller cities should be able to get theaters for around $400. 2)	Provide us details on how you can fill the seats. We need you to be confident you can get at least 100 people in the theater (which is harder than it may seem). Hopefully there are some large groups in your area who are interested. It might even help to create a sign up list of people interested in seeing the movie (we can help with this). It might help to run the screening as a fund-raiser. We only charge $10 a ticket, but if you want to charge $11 or $12, let us know & we will write your group a check for the extra amount (as long as we sell enough tickets to cover the rental & delivery fees). 3)	Be at the event to make sure things run smoothly. Some people will have hard copy tickets, but others may use will call and be on a list. We’ll give you a master list of who bought tickets and you or another volunteer will need to let people in. We’ll provide the theater with a screening disc (usually BluRay) ahead of time. No promises, but depending on our schedule & your location, one of the filmmakers might even attend your screening & be available for a Q&A session afterwards. 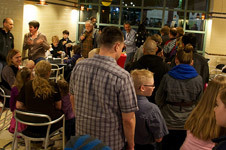 To arrange a screening, please gather up as much information as you can, then contact us. We’ve created a solution for eager individuals or groups to host smaller screenings in libraries, community centers, theaters, churches, business rooms or even large living rooms. We’re excited about this grass-roots way to spread the film across the globe. 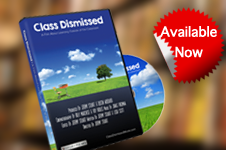 To host a screening, you simply need to purchase our DVD screener pack, then find a projector, large TV, or place with equipment to show the movie. It’s up to you to decide how many people are invited and how you cover the cost for the screener (some have their group buy it, others have suggested donations, and some just pay for it themselves). 1) The screener DVD - regular DVDs won’t be made available until later in 2015. 3) A screening & post discussion guide to help you have a conversation after the screening. 4) A resource guide packed full of useful homeschooling resources for families interested in learning more about the various education methods highlighted in the film. 5) Other resources like downloadable posters, coupons, marketing tips and surveys. The screener pack ranges from $75-$250 depending on your intentions. Learn more by clicking the button above. 1)	Look up the cost & deadlines for the festival. They can usually be found on the festival site, but can also be found on withoutabox. Make sure they allow feature length documentaries (some festivals are just for short films). 2)	Consider donating the entry fee. Fees range from $15-100 depending on the festival. We’ve already submitted to Sundance, SIFF, Atlanta Documentary Film Festival and the Independent Filmmakers Showcase and will submit to others. To donate the entry fee, use the donate button below. Then contact us to let us know what festival your donation is going towards. 3)	If you know someone who works for the festival, be sure to let them know to keep an eye out for our film (and let them know if you donated the entry fee). Festivals are hit or miss depending on the taste of the random volunteer film screener. If you can get the attention of one of the festival programmers or board members, the film will have a much better chance of being selected.